Garmin International Inc., a unit of Garmin Ltd. (NASDAQ:GRMN) , today announced Hunt View Maps, a series of preloaded microSD cards containing land ownership data for Colorado, Idaho, Montana, Wyoming and Utah. For years, Garmin handhelds have been a necessary tool for destination hunters. Now with Hunt View Maps, hunters can easily integrate essential data like public vs. private land information, satellite imagery, 24K TOPO mapping and routable roads into their Garmin handheld GPS units. Hunt View Maps provide hunters with an easy solution to keep essential land data on-hand to ensure hunts are kept within legal boundaries. 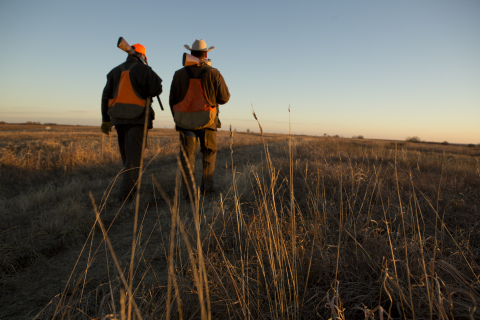 Each Hunt View Maps microSD card comes preloaded with data for one entire state. Simply insert the microSD card into the compatible Garmin handheld device1 to access the information. Hunt View mapping provides borders and boundaries for a variety of land types, including Army Corp., Bureau of Land Management (BLM), Bureau of Reclamation, Department of Defense (DoD), forests, grasslands, national wildlife refuges, national parks, state parks, state trusts, tribal, Works Progress Administration (WPA) and Wildlife Management Areas (WMA), as well as parcel boundaries2 and rural roads. In addition to land ownership and management data, each Hunt View microSD card features routable data for turn-by-turn navigation, even for rural roads and trails, so hunters can easily navigate around unfamiliar areas. For even more detail, Hunt View Maps also includes satellite imagery and TOPO US 24K data. Accessing Hunt View Maps is as simple as inserting the microSD card into the handheld unit. There’s no need to plug the unit into the computer or download any additional information. All data is easily accessible right out of the package. Hunt View Maps are compatible with a variety of Garmin handheld devices, including the Oregon(R) 600 series, GPSMAP(R) 62 and 64 series, Montana(R), eTrex(R), Rino(R), Alpha(R) and Astro(R). For the complete list of compatible devices, click here. The new Hunt View Maps will be available in October 2014, and each map will retail for $79.99. Hunt View Maps is the latest solution from Garmin’s growing outdoor segment, which focuses on developing technologies and innovations to enhance users’ outdoor experiences. Whether hiking, hunting, geocaching, golfing or dog training, Garmin outdoor devices are becoming essential tools for outdoor enthusiasts of all levels. For more information about Garmin’s other outdoor products and services, go to http://www.garmin.com/outdoors. For 25 years, Garmin has pioneered new GPS navigation and wireless devices and applications that are designed for people who live an active lifestyle. Garmin serves five primary business units, including automotive, aviation, fitness, marine and outdoor recreation. For more information, visit Garmin’s virtual pressroom at garmin.com/newsroom, contact the Media Relations department at 913-397-8200, or follow us at facebook.com/garmin, twitter.com/garmin or youtube.com/garmin. 1 To ensure maximum compatibility, a firmware update using Garmin Express is recommended. 2 Parcel Data only available in Utah and Montana. Garmin International Inc. is a subsidiary of Garmin Ltd. (Nasdaq: GRMN). Garmin Ltd. is incorporated in Switzerland, and its principal subsidiaries are located in the United States, Taiwan and the United Kingdom. Garmin, Oregon, GPSMAP, Montana, eTrex, Rino, Alpha and Astro are registered trademarks and Hunt View is a trademark of Garmin Ltd. or its subsidiaries.